Yes, I really jumped out of a working aeroplane this weekend! - When pigs fly. Yes, I really jumped out of a working aeroplane this weekend! What was this elusive task that took an extra year to complete? ...Skydiving. I love to fly, ride roller coasters, and partake in other thrill rides -- although I have a crippling fear of heights when I'm not 'strapped' in (watch me climb a ladder beyond the first story of a house, and you'll see what I mean!) Skydiving has no seat, lap belt or anything else to make you "feel secure" -- no wonder I put it off for so long. I made my reservation and paid my $75 deposit about two weeks before the jump, and then started counting the days until the big day! I didn't sleep very soundly Friday night, especially after spending the evening double-checking my life insurance policies, beneficiaries, and ensuring that my affairs were "in order" in the event something didn't go quite right. I left home on my motorcycle about 11:30 11 August 2007 and arrived at Skydive New England in Lebanon, Maine about an hour early at 14:00. A class (required for your first jump, even though you are diving tandem) was scheduled for 15:00. The class mostly talked more about the risks and dangers of skydiving, repeating a lot of what was already clearly printed in the approximately seven-page contract and waiver and hold harmless agreement which has to be signed and initialled in enough places that I thought it might have been a mortgage! Seriously, after signing the agreement, they probably could have taken me out back and shot me and I don't think I'd have been able to sue anyone! After all the paperwork was complete, and the remainder of the expense for the jump was settled, I went to wait to be called on the loudspeaker. Of course, my luck, clouds rolled in and everything was shut down for about an hour. (There are very specific flight visibility and clearance from cloud requirements in this extreme sport -- see FAA Rules, Section 105.17) Once the clouds cleared, things began moving rapidly! My name was on the screen paired up with my tandem master, Selwyn, a very friendly brit who had been doing this for some time. I proceeded to the hangar to be strapped into my harness -- I opted to jump in my "street clothes", rather than a jump suit. As soon as I had my gear on, we boarded the van which drove me and 16 other jumpers from the hangar to the air strip. The van was not unlike a subway car with straphangers on wheels. The drive took all of five minutes, and we went right from the van into the plane -- all the jumpers faced the rear of the plane on two long benches parallel to the body of the plane. We put our seatbelts on as we taxied down the runway. This was nothing like any commercial flight you've ever been on! Once at 1,000 feet, seatbelts were released, our gear was double-checked and I was hooked up (loosely) to Selwyn. We climbed to 14,000 feet over the next 10-15 minutes, as we approached the drop zone, the harness was tightened and instructions for body form and exiting the plane were repeated. Once the green light was on, the folks in front of me, one by one, exited the plane. Due to the interior height in the plane (lack thereof), having a full-grown adult strapped to my back, you have to "waddle/shuffle" down the bench to the door. It was awkward. Irrational last minute fears started to surface in my mind as I realized, "Oh crap -- we're next!!" As I approached the huge gaping opening in the side of the plane, a mixture of panic and an eerie sense of calm prevailed. There was no backing out now -- I assumed proper form (arms crossed on my chest, my head placed on the right shoulder of my tandem master), and turned my life over to Selwyn's capable hands as we jumped out!!! Once out of the plane I arched by back (belly down position), bending my legs and arms upwards in order to facilitate proper drop position. The initial rush as we accelerated to terminal velocity was over in the first five to ten seconds (terminal velocity of a skydiver in a normal free-fall position with a closed parachute is about 195 km/h or 120 mph or 54 m/s.) Being a motorbiker, I'm comfortable feeling the rush of the wind at these speeds -- I'm just used to travelling in a different vector (direction), having controls such as brakes and clutch in my hands, and feeling/hearing the engine running with a seat between my legs! "IAteTokyo" from teammantis (the diver featured in the photos in this blog entry) says it best: "Instant relief was followed by immediate euphoria as my brain was awash in released endorphins." Here I was, a meat missile, travelling at 120 mph with no direct "control" over my decent other than being able to "steer" right and left (using my hands like rudders on a boat) and having the option to pull the chute at any moment. With no reference point and at terminal velocity, it felt more like floating – peaceful and serene is the only way I can describe it. Unlike going over a cresting hill on a roller coaster or taking off/landing in an aeroplane, there were no G forces (butterflies in your stomach) which really surprised me. All of this realization took place in the initial fifteen seconds -- I had just over forty-five seconds left to "play!" While suiting up and on the van, I chatted with Selwyn about my desires and goals with my first jump. He was a great tandem master, as he said that he would let me "steer" whilst in the freefall, showing me hand positions as we dropped. When we were at 5000', he would direct my right hand to the chute release and allow me to pull the chute. When we were free-falling, I could turn left and right 360' rapidly or slowly, simply by moving my hands. 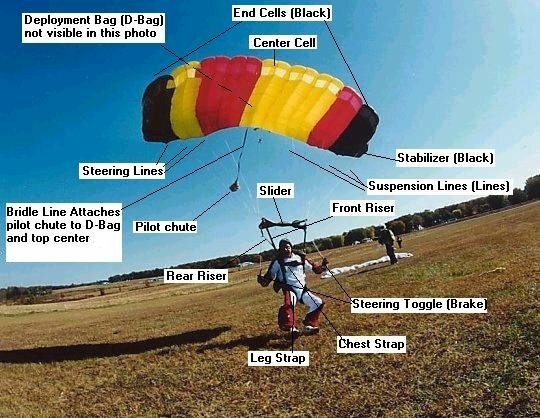 Sadly, due to the nature of the parachute in this dive, There was no control over back flips or barrel rolls (the pilot chute opens upon plane departure - see the parts of a parachute photo), which I believe is what prohibits these sorts of manoeuvres. In free-fall it's somewhat instinctive to stare straight down to the rapidly approaching ground, the houses, streets, automobiles driving on the highways, power lines and all -- but a good tandem master will grab your head and turn it upwards to the horizon to remind you to look at the beauty of the surrounding land. Skydive New England is located on the border of New Hampshire and Maine, and from 14,000' you can see Mt. Washington and the white mountains to the west and the Atlantic Ocean to the east and all sorts of things in every direction -- far too many to take in on your first jump. Selwyn grabbed my right hand and placed it on the chute release (an orange coloured golf ball shaped device), I was thinking to myself that 5000' came far too soon as I pulled the knob down and out. I was expecting "the wedgie from hell" at this point, and was very surprised to find that although there was a strong jerk, it wasn't nearly as uncomfortable as I imagined it would be. Suddenly, the sound of rushing air went silent. It felt as if I had my earplugs (from the motorcycle) in place -- when I realized that it was the pressure change that cause my ears to rapidly plug up. I grabbed my nose and popped my ears back to normal -- my hearing was back to normal. It was oddly silent after the canopy opened -- sure, I heard the flapping of the parachute in the wind, but other than that gentle "kite flying" sound, it was dead silent. I could now talk with Selwyn about the dive in a normal voice. The next half of the jump consisted of steering and controlling the canopy -- there are two toggles (handles) that allow you to turn right, left, or when you pull both, simply hang in the air almost motionless. I got a few minutes experimenting with the steering of the chute when it was time for Selwyn to line us up for landing... I was excited about the jump, but very disappointed that it was almost over now. Landing was my other major concern -- but as directed, I pulled my legs up as we touched down for a perfect landing in the drop zone. I always thought that the touch-down would be hard on my knees, or that I would stumble and fall. Honestly, the actual impact of landing was far less than jumping from one stair onto the ground when we both touched down on both feet. I've already pre-paid my next jump and am seriously considering the AFF (accelerated free-fall) skydiving classes to get my "class A" skydiving licence! Photos in this posting are NOT of me, but were taken at the same drop zone (Skydive New England) by "IAteTokyo" from teammantis. I did not pay extra to record my skydiving experience on DVD and photos -- I really didn't want to be distracted during my dive by having to "perform" for the camera and working with the photographer -- this dive was all about me, experiencing the feeling and experimenting with control of the flight. Perhaps I'll have the next one recorded, but in all honesty, I don't know. I really felt whilst skydiving that it was a somewhat meditative, personal experience. If there is a God, I've never been more close to him than I was for those few moments, and I don't think it was something to show off to the world on You Tube. "perfectly good" is a stretch for the planes normally used for skydiving! ;-) The flight up is more scary than the trip down for some! I was amazed at how quickly the groud comes up at you! Wow... thank you so much for the description! I have always wanted to try skydiving. (I'm a nut, I know...) My favorite line? "Here I was, a meat missile..." I laughed out loud! *hugs* (some day you can take Emily up...) Hahah!